SUMMARY: Annie's boyfriend Kyle was training to run his first marathon when he was tragically killed a few months ago. Now Annie, who has never run more than two laps around the track in her life, is training to run the marathon Kyle never completed. In the process of honoring his memory and moving past her grief, Annie learns to live and love again. REVIEW: I've read all of Kenneally's Hundred Oaks books (now totaling 5), and I love all of them. It's hard to say which is my favorite, but Breathe, Annie, Breathe is definitely up there. This is a story of a girl trying to move on after a life-changing event and unbearable grief. I love the honesty of this story and the role of exercise in healing. Though Annie blames herself for her boyfriend's tragedy (as grieving people sometimes do), she never turns that grief inward or allows herself to fall into a serious depression. She grieves with her family and her boyfriend's family. She doesn't understand how others around her are able to move on, how life can continue without Kyle in the world. Teens dealing with the death of a loved one may find some solace in Annie's story. Her grief feels real, and I've heard that running or heavy exercise can truly help people battling depression and sadness. I love how Annie trains with a professional (Matt from Things I Can't Forget). She takes her training seriously and though she doubts herself often, she pushes through her fears and pain and grief in a healthy way. It actually makes me want to train to run a marathon. Or at least a mile. I loved the romance and the characters. Matt was previously my favorite Kenneally boy. Jeremiah (Matt's younger brother and the love interest in this story) just replaced him. As with her other books, Kenneally adds a few character cameos. We get to see more of Jordan and Sam (Catching Jordan), Matt and Kate (Things I Can't Forget), Savannah and Jack (Racing Savannah), and Vanessa and Rory (Racing Savannah). Only Parker and Will are missing this time. I frequently compare Hundred Oaks with Katie McGarry's Pushing the Limits series, but I think I like Kenneally's books just a little better. I just never get tired of reading Kenneally's books. They don't feel formulaic, even though they do all follow a friends-to-lovers romance pattern. But Kenneally's books are all different enough to keep me riveted. 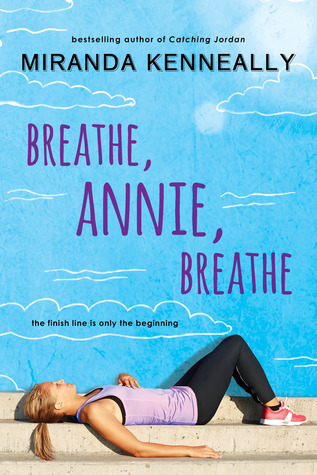 As with all the others in the series, I read Breathe, Annie, Breathe in one sitting. I've heard there are supposed to be six books in this series. I'm hoping to hear Evan's story in Book #6--I felt kind of sorry for him when Annie turned him down. THE BOTTOM LINE: Love this series. Best for upper-high school or college-aged readers due to sexual content. STATUS IN MY LIBRARY: Too mature for middle school.